MOUNTAINVIEW, California — The moon is sprinkled with historical hardware hurled fromEarth that signifies the pioneering steps taken over decades in robotic andhuman exploration of Earth's celestial next-door neighbor. But numbersof spacefaring nations, including commercial enterprises, are readying theirrespective assaults on the moon. That fact has sparked growing concern aboutsafeguarding lunar heritage sites, keeping them free of future "Kilroy washere" graffiti-like abuses. This issuewas aired at the NASA Lunar Science Conference staged here July 20-23 by thenew NASA Lunar Science Institute situated at the space agency's Ames ResearchCenter. "TheApollo sites are, in fact, historic. They are treasures that need to bepreserved," said noted author and authority on space exploration AndrewChaikin. His books include the acclaimed "A Man on the Moon" (Viking,1994), the impetus for the Tom Hanks HBO television miniseries, From theEarth to the Moon. "Weneed to think very, very carefully about how we are going to revisit thosesites and not destroy the record of the first human explorations of anotherworld," Chaikin said. "But having said that ? not every footprint onevery Apollo site need be preserved." Chaikinpointed out that there's likely to be very interesting science to be gainedfrom visiting Apollo landing spots, given safe approaches to those locales. "We needto figure out which of the footprints you don't want to wipe out. That powderysurface is unlike any historical site on the Earth ? and the footprints couldbe wiped out at a moment's notice with our first revisits," he said. Preservingexploration heritage in the era of private ventures to the moon was flagged byPhilip Stooke, associate professor in the Department of Geography at theUniversity of Western Ontario, London, Ontario, Canada. Stooke saidthat commercial lunar efforts — such as the GoogleLunar X Prize — have the potential to interact with artifacts from thefirst era of lunar exploration. The GoogleLunar X Prize is a $30 million competition for the first privately funded teamto send a robot to the moon, travel some 1,640 feet (500 meters) and transmitvideo, images and data back to the Earth. 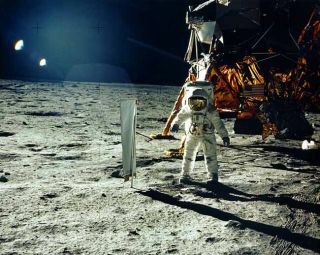 Bonus prize money can be won bytaking on other mission tasks, including the imaging of human-made artifacts,such as Apollo hardware. That beingthe case, Stooke has posed: What rules or guidelines exist, or might beinvolved in the future, to mediate this interaction? He suggested thatguidelines are needed to treat old sites with respect without placing unduerestrictions on future activities. What about otherearly artifacts such as the former Soviet Union's Luna 9 — the first spacecraft to achievea lunar soft landing and to transmit photographic data to Earth — or that nation's automated Lunakhodrovers? Similarly, what about old NASA Surveyor robot landers that were ploppeddown on the moon? Opinionsrange from complete protection to complete lack of regulation, Stooke observed. But the Apollo11's Eagle landing zone in the Sea of Tranquility back in July 1969, Stookecommented, should be regarded as an untouchable piece of real estate. "Itshouldn't be trampled over and scavenged by private sector rovers," Stooketold SPACE.com. "Don't mess it up with little rovers doing wheeliesover the footprints ? or backing up a rover and hitting the flag bymistake." However,other Apollo landing sites might be treated differently, Stooke suggested. Six Apollolunar landers touched down on the moon between 1969 through 1972. Thesetwo-person vessels enabled moonwalkers — often tagged the "dustydozen" — to carry out work on the lunar terrain from Apollo 11's modest2.5 hours to Apollo 17's campaign of forays that added up to over 22 hours. It turnsout that the Apollo 17 lunar lander — Challenger — was documented pre-launchwith samples taken from various items that would be emplaced on the lunarsurface during the moonwalking mission. The intent was, perhaps sometime in thefuture, these materials might be returned to Earth for comparative appraisalwith non-flight to the moon items. Thoseunique samples kept here on Earth are still in a storage box at the NASAJohnson Space Center in Houston, Texas, explained Wendell Mendell, chief of theOffice for Lunar and Planetary Exploration in the Constellation Systems ProgramOffice. "Itraises the question as to whether the Apollo 17 site then has historicalimportance ? or whether it has practical importance, assuming we get backthere," Mendell told SPACE.com. Taking a look at how some of thosedeployed assets on the Apollo 17 mission withstood exposure to the lunar andspace environment, he added, would help designers figure out hardware designsintended for much longer stints on the harsh moon. Mendellemphasized that the concern that someone is going to go crash into and trash anApollo site is overblown. "Nobody has that kind of disregard of theimportance of the first explorations on the moon," he said. MargaretRace is a principal investigator for the SETI Institute in Mountain View, Calif.An ecologist, she is a leading expert on the importance of planetaryprotection. Race notedthat the issue of protection of special regions, wilderness areas, set asidesand pristine sites on the moon is gaining scientific attention, most recentlyat the Committee on Space Research (COSPAR) Scientific Assembly held July 13-20in Montreal, Canada. "There'splenty of debate out there as to how it should be implemented," Racereported. One of theteams now vying for the Google X Prize is led by Bob Richards, Chief ExecutiveOfficer of OdysseyMoon Ltd. He said that there are two dimensions to the question of lunarheritage site preservation: ethics and legality. "Igrew up a country boy where showing respect for private property was simply theright thing to do. Additionally, by international space treaty, anything on themoon belongs to the people who put it there. Odyssey Moon is about theresponsible development of the moon and in the absence of any laws covering ouractivities ? we will do what's ethically right," Richards told SPACE.com. OdysseyMoon will respect the property of others, Richards continued, and will not riskdisturbing it without permission to do so. "We will also expect the samerespect and protection for any commercial private property we place on themoon." Sites likeApollo 11 are monuments to our history as a species that should be preservedand honored, Richards said. "However, there are also important reasons whygoing back to a lunar heritage site has value for scientific, educational orcultural reasons. For instance, knowing the amount of radiation degradation or dusteffects on hardware is important for future exploration and settlement,"he said. Not everysingle footprint or scrap of metal on the lunar surface is hallowed ground,Richards explained, but much of it is. "It's a question of showing commonsense and always asking permission to visit or disturb something that's notyours. Odyssey Moon hopes to help establish the legal and regulatory precedentsfor everyone playing nice and developing the moon for the benefit of allhumanity," he concluded.